Sponsored by : Sunrise Radio Listeners In London, U. K.
Yoginagar is located on Bhachau - Bhuj State Highway, 30 Kms away from Bhuj, apprx. 1 Km interior. The village has 87 families whose houses were totally destroyed on 26th Jan 2001 when the earthquake leveled almost everything that stood including schools and shrines. The village consists of Ahir, Goswami and Muslim community. Ahir women are known worldwide for their embroidered Chaakalaa and patchwork artistry. Sadhus from Bhuj BAPS temple visited this village on 28-01-2001, with relief materials, which was their first association with the villagers. Subsequently, BAPS adopted this village for rehabilitation. Allocation of land and governmental procedures took some time. No sooner land for the new village, half Km away from the ruins, was allotted, Bhumipujan was performed on 29.06.2001. With the blessings of HDH Pramukh Swami Maharaj the new village, Yoginagar, was born. Actual construction work started in August 01. Allocation of land and governmental procedures took some time. No sooner land for the new village was allotted, Bhumipujan was performed on 29 June 2001. 12 m x 20 m. = 250 sq. m.
150 sq. m. Or 100 sq. m.
Front 7.20 m. 7.20 m. 7.20 m.
One at the Highway Junction : 24' high and 31' wide, the traditional entrance gate welcomes all visitors. Second at the village entrance : Smaller in size it is equally impressive with Lord Hanuman's temple outside the entrance symbolizing protection to the village. 2 large donation plaques in black granite with gold-leafed letters, one in Gujarati and another in English give details of the village, the inspirer, the sponsors , the inauguration date and other data. 4 Classrooms each 5.0 m. x 6.0 m. in size, with mosaic floors. 2 separate dining rooms for "Mid-day Meal" scheme. A multipurpose hall will help to manage all big or small functions of this village - be it a marriage or a birthday party or even a social meeting of the village residents. HDH Pramukh Swami Maharaj has satisfied another very important need of the village by offering this administrative office to carry out village's all public, community, governmental work. A spacious room of 16' x 30' caters to the primary health needs of the village. A 10" bore fills up an underground tank of 45,000 liters from which an overhead tank of 20,000 liters capacity is filled. Each house of the village gets water via underground pipelines, by the latest technology of pressure-system technology that ensures smooth and even distribution of water, with adequate pressure. Water is available aplenty and round the clock. Each house and building is provided with a 20' deep drainage well for sanitation purpose as per norms required. Two prayer halls, 64' x 30' & 21' x 11' for regular prayers and assemblies. Beautiful gardens add to the majesty of the Temple. The village has a central coal tar road, paved on both sides. Main Road from the entrance, over 20 feet wide, is well connected with side roads, covering the entire village. Tree plantations at a regular distance of 10 ' along all the roads help bring down the temperature of the place as also provide serenity. 65 ft. x 45 ft. in size, the building and shades will accommodate 400 cows outside the village outskirts. Each house is complete with required electrical wiring, fans and fluorescent lights. Main road and all side roads are provided streetlights. 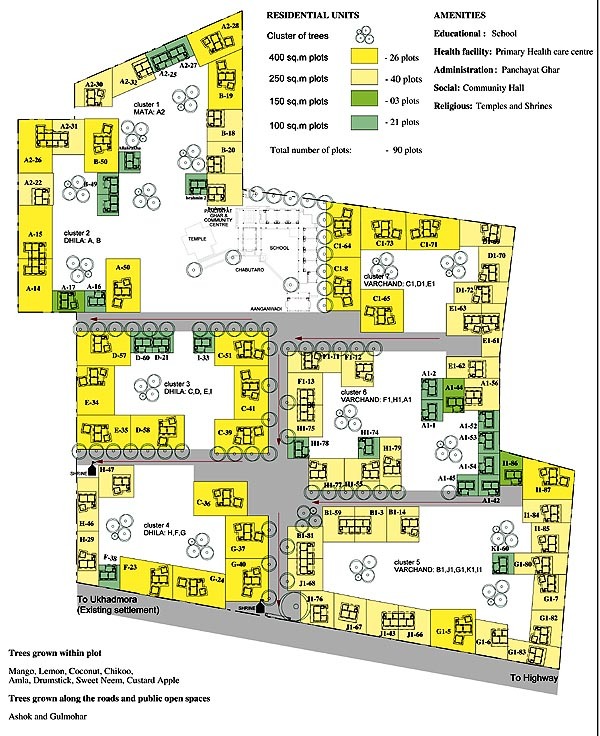 Each house has minimum 12 trees in the courtyard; all the roads have trees planted at a distance of 10' with areas earmarked for clusters of trees. The entire outskirts and the village boundary have minimum 1000 trees planted to provide vegetation cover. The village square is the open space between the school, health center, the community hall and the temple. This will have a chabutaro for birds (under planning). The entire village, each individual house was cleaned, washed and decorated with AsoPalav Torans to greet the residents on the auspicious occasion of the dedication ceremony. Pujya Doctor Swami was welcomed at the main entrance by all residents traditionally with Shehnai and Dholak.. Pujya Doctor Swami consecrated the Hanuman Temple and did Pujan of the two plaques on the sides of the entrance announcing official dedication of the village Yoginagar to the owners. By cutting open the Nadachhadi, he pronounced the village Yoginagar open to the residents. Village Yoginagar was graced by his presence in the assembly there. People not only from Yoginagar but also from nearby villages had come in tractors. Pujya Devcharan Swami welcomed the gathering present, which included BAPS sadhus from various places, invited guests and residents and neighboring village folks. Among the VIPs present were Bhuj Mayor Mr. Sompura and patrons of EENADU group from Andhra Pradesh. The donors of Yoginagar project, Sunrise Radio Listeners In London, U. K., could not remain present. A letter written by Mr. Avtar Lit, on behalf of Mr. G. K. Noon and Judge Mota Singh, was read by Pujya Brahmavihari Swami. Their wishes were well received and appreciated by the Yoginagar villagers, who expressed their gratitude to the donors for the generous donations. It was also evident from the sentiments of the residents that a mountain was moved from afar, by the SUNRISE RADIO LISTENERS IN LONDON. All of them were remembered and thanked profusely in his speech by Pujya Brahmavihari Swami on behalf of the villagers. Bhuj Mayor and invited guests also spoke befitting the occasion. HDH Pramukh Swami Maharaj could not attend the ceremony but he had remembered the Yoginagar residents. In his personal message to them, he conveyed his blessings and prayers for their Peace and Prosperity. Addressing the assembly, Pujya Doctor Swami stressed that God should be kept at the center of all our activities. A village is not just houses and roads, but it is a collection of values. Children should respect their parents, while the parents should turn their houses into schools of culture and values. He inspired the people to leave addictions and wrong habits of smoking, chewing tobacco, etc. so that family bonds become stronger. Reading of religious texts and daily satsang in the house will strengthen family ties and ensure good character. He prayed for the donors, and honoured the architects of the project and other key persons who had worked hard to complete the project in time by presenting them with beautiful shawls. The eagerly awaited ceremony of handing over the keys was performed very traditionally and religiously. Each key was traditionally packed with betel nut and Gol-Dhana, symbolic of the pious ceremony, in a beautiful transparent plastic container. Each container was numbered to convey the house which they will occupy. The villagers were happy to occupy their homes.